Dry skin during the winter is a given. A cold, windy, snowy winter sure does a number on my skin! I end up loading up on the lotion to keep my hands nourished and fresh feeling. I hate dry flaky, skin! I must say though, finding good choices in beauty care can be a challenge! There is a hard balance between finding natural products (that don’t have artificial ingredients, petroleum and chemicals) AND not breaking the bank to buy them! Well, HELLO JollyBod! This skin care line is handmade with love in my home state of Colorado. 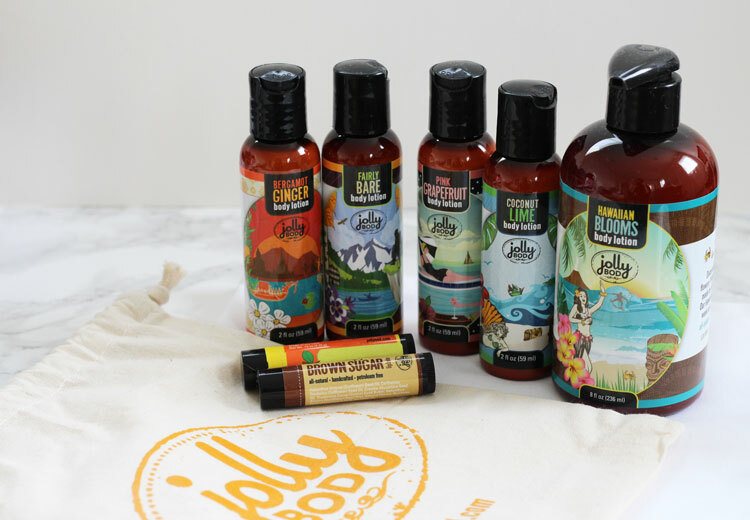 All JollyBod skin care is natural, handcrafted and petroleum free! 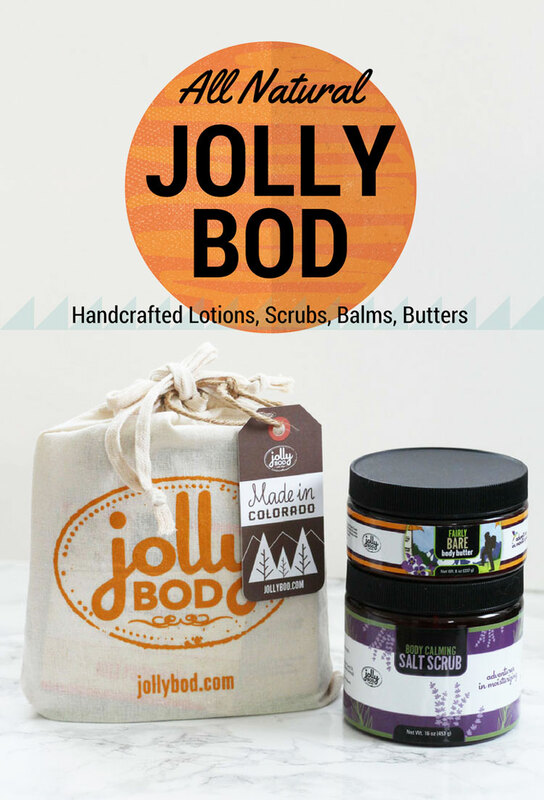 JollyBod is a local, family operated skin care line that makes body butters, lotions, scrubs and balms. The luscious natural products are made in full size and travel size options. JollyBod began when the owners needed to find better products for their son’s medically dry skin. They struggled to find a good solution on their own and even with doctor’s recommendations. Instead they took matters into their own hands, and JollyBod began! Maintaining a healthy body, means from the inside out. 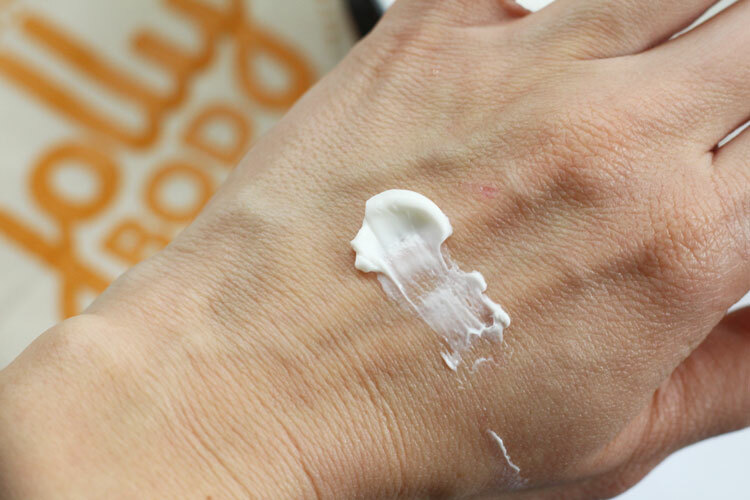 Not only should our food be clean and organic… the products we put on our skin should be too! Think about it. That lotion on your skin is soaking into you body! You don’t want chemicals and artificial ingredients that mess with your hormones and immune system wrecking havoc in there, do you? 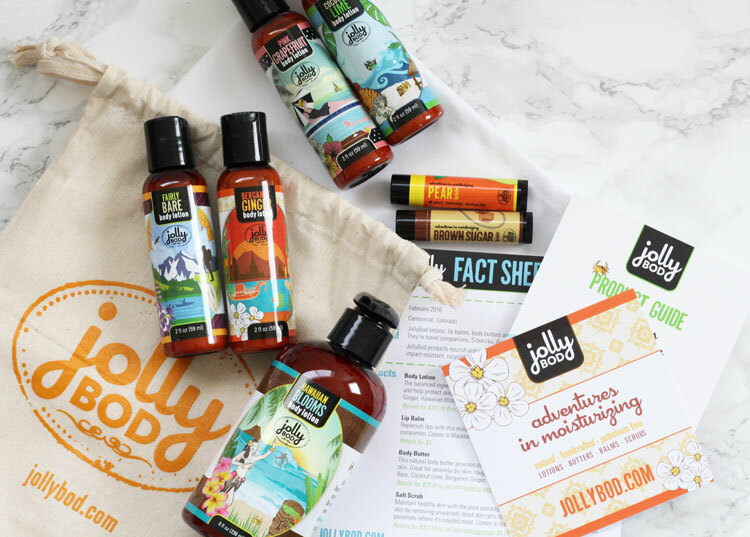 Are Jolly Bod Products Better? I had the opportunity to test out some JollyBod products. Do I think JollyBod products are better than those popular lotion brands? Well, yes. The JollyBod product ingredient list is superior in quality and the products work great. I tested a body butter, salt scrub and travel products. This salt scrub smells like heaven (lavender). I used this to treat my skin after a long day on the slopes. After sweating and freezing multiple times while skiing, I came home eager to jump in the bathtub and to use my JollyBod products. I applied the JollyBod salt scrub gently with a wash cloth. 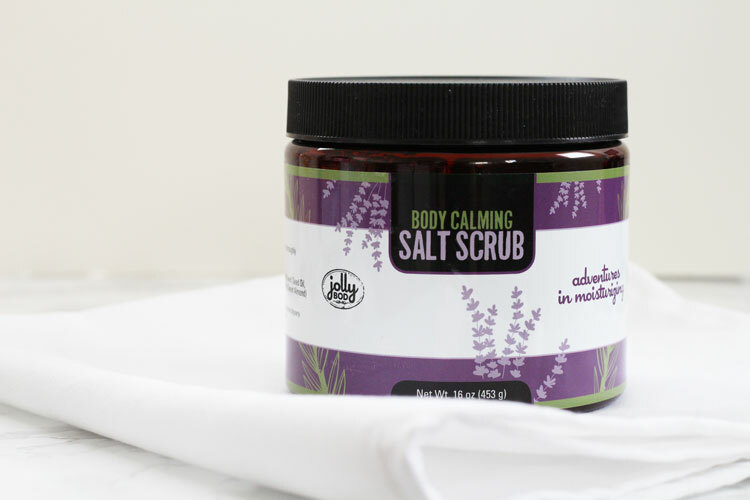 Quickly, it exfoliated and removed dead skin – while relaxing me with the calming scent of lavender. 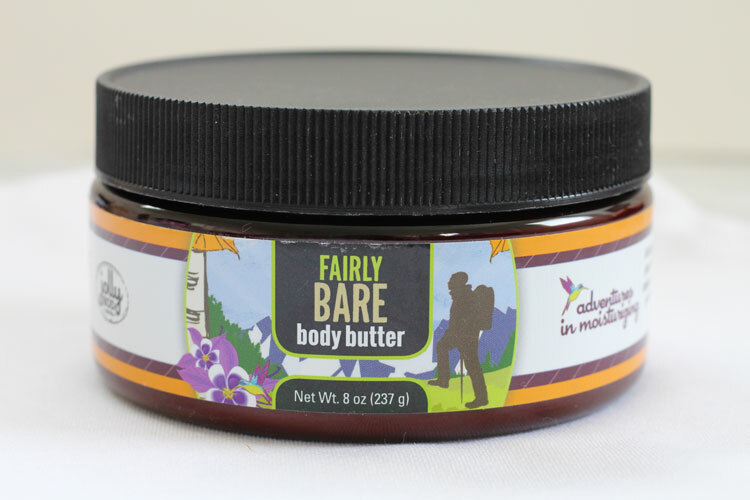 The JollyBod Fairly Bare Body Butter is rich and creamy. It is free of added fragrances, and has simple ingredients like shea butter, jojoba seed oil and sweet almond oil. After the bath, I added moisture to my skin with this simple, barely scented body butter. I love not being overwhelmed with scent when I am covering my body in something. It is light and delightful! The rest of the JollyBod products I received came in the cutest environmentally friendly knapsack pouch. The JollyBod body lotion scents are light and simple. The scents I tried included: Beramot Ginger (slightly spicy and awakening), Coconut Lime (zesty and soothing), Pink Grapefruit (sweet and simple), Fairly Bare (scent free) and Hawaiian Blooms (floral and tropical). The lotions soak into your skin quickly, don’t leave an overpowering scent lingering and really nourish my skin. The JollyBod lip balms come in a variety of nifty flavors including blackberry, pear, mint, brown sugar and plain. I dried my chapped lips with the brown sugar and the pear lip balms. Both JollyBod lip balms smelled amazing! They worked great to lock in moisture after my lips got wind burnt while skiing! Soon after applying this lip balm, my lips were no longer dried out and cracking – but smooth, soft and moisturized! This sounds like a great line of products. I would love to try the salt scrub. I have never heard of this brand, but it looks like it would be really good. My daughter has very dry skin, so I am going to have to try this out with her. Wow this is awesome! I have never heard of this skin care line before but I will have to check them out now. I love all natural skin care products! I’ve never heard of it but it looks good hen it comes to skin care! I haven’t heard of this brand before today. It sounds like a great product and I love that it is natural. I need to give it a try, my skin could use some TLC. Sounds like a great skin care line. I’m always looking for new skin care to try out. I really like the way the packaging looks on these too. I love trying new skincare lines, especially those that use natural oils! I would love to try some scrubs! I like light and simple and natural, and of course inexpensive. I love that it’s made in Colorado! Sounds like some great products! Love the packaging, too!